Qantas switched on its free inflight internet service trial on April 7, with Virgin set to launch its own similar program later this month. It’s been one year since Qantas made its original announcement of inflight Wi-Fi, and five months since the first trial period was postponed. Qantas and its service partners acted fast to bring its trial to fruition. Qantas’ inflight free internet trial across Australian domestic routes will be based on the ViaSat satellite broadband service, and will use NBN Co’s SkyMuster satellites. These are the same satellites that deliver broadband internet to remote Australia. So what will the demand on this service mean for internet customers on land and in the air? The Skymuster geostationary satellites (positioned about 36,000km above Earth) act as an internet bridge, connecting a ground-based internet gateway to broadband customers on the aircraft. A specialised satellite receiver installed in the plane provides the link to the satellite, in much the same way that a residential broadband installation connects homes to satellites. 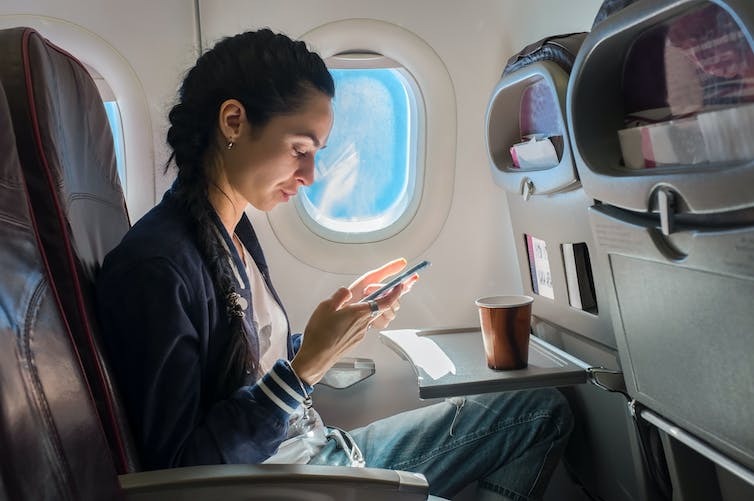 An onboard network of Wi-Fi routers then provides a direct internet connection either to an entertainment system installed in the seat, or to a compatible device belonging to the passenger. Compared to onground Wi-Fi, onboard service delivery involves a relatively large number of passengers sharing the same satellite link. The satellite receiver on the aircraft therefore needs to meet stringent design and operational requirements and can be very expensive for airlines to install across their fleet. Qantas’ own customer survey cites accessing emails (52%), web surfing (46%), streaming music, TV or movies (31%), accessing social media (30%), and news (30%) as the most popular modes of expected use. Qantas and other carriers are also seeking to gain more efficiency across their flight management by allowing crew to obtain real-time updates on flight details via in-flight internet. Through a combination of new satellites with improved capacities, plus optimisation of the data flow from different services accessed by different passengers, service providers are promising better services. Qantas’ announcement claims availability of ten times the speed of conventional onboard Wi-Fi using older satellites. But it remains shy in speculating on the actual speed of the connection that passengers can expect to experience. Currently, outback residential customers accessing similar services through SkyMuster satellites experience peak speeds of 25Mb per second downstream and 5Mb per second upstream. Broadband customers in urban areas can expect much higher data speeds. NBN Co recently started offering 100Mb per second and 40Mb per second peak downstream and upstream rates. If you assume 30% of passengers use the service on a Boeing 737 (trial aircraft, 174 passengers), they can reasonably expect speeds of only a few Mb per second. With content being accessed on 9" seat-mounted displays/tablets or 4-5" mobile phone screens, passengers might be able to enjoy reasonable quality streaming services or watch their favourite footy game live, as has proved to be the case on a recent trial flight with Qantas inflight internet. But as the data streams need to travel long distances (from ground to satellite, and then satellite to aircraft), service can experience time delays, referred to as latency. This may affect the customer experience when real-time interactive communications such as video conferencing or online games are in use. ViaSat claims to offer more than 100Mb per second to aircrafts with the use of specialised satellite transmitters and receivers installed on aircrafts. The company is already working with carriers such as American Airlines. Finnair, United Airlines and Virgin America also signed up for the services over America and Europe. Internet delivery company gogo also has a hold on this fast developing market, with other carriers as its partners. Satellites provide broadband connectivity by dividing set geographic regions into smaller areas. Specific beams are set up to transmit and receive signals in an independent manner. This provides more capacity shared among fewer customers, and is designed to optimise service delivery to fixed residences and support applications with low-speed mobility. For example, Skymuster satellites use a mix of small (135km radius) and wide (325km radius) beams over different regions. When such service is delivered to aircraft traversing wide distances at very high speeds, handover between multiple beams must be addressed. Depending on the use of smaller or wider beams, such issues could be tackled by networking techniques at the expense of some bandwidth. The Wolumla ground station that communicates with the Sky Muster satellites. Techniques currently in play to improve delivery of satellite broadband include compression (to reduce the amount of data to be transferred), buffering (by caching every byte of information transmitted) and acceleration (techniques relating to how packets of information are handled and how connections are managed). The fundamental limitation caused by internet signals traversing back and forth between the earth and space remains a major issue. Also, satellite broadband service depends on wireless transmission over a medium prone to weather effects and volatility. Any minor drop outs in services are exacerbated by the long round trip delay involved in satellite transmission, as it takes longer to repair and restore connectivity. Also, when multiple people connect and reconnect via such platforms with significant delays, the resilience of satellite-based connectivity might face challenging stability issues (like those experienced by NBN customers in 2016). Problems linked to pricing and capping of in-flight data packages also need to be considered. A spokeperson for NBN said that despite the launch of new onboard services, satellite broadband provision to the outback will be prioritised. But many in the bush are worried about their state of broadband connectivity. It’s an issue that will likely be exacerbated by expanding demand with growing numbers of broadband-using passengers on domestic air routes. Broadband use in remote Australia is also increasing, and not just for communication. Many applications based on the “Internet of Things” require internet connectivity. In regional Australia, these range from logistics management, smart farming to facility management in the resources sector. All these services will place growing demand on satellite broadband. Planning for the time when Skymuster satellites approach capacity limits should be considered. As SkyMuster II starts to deliver services, this might relieve the bandwidth demand. 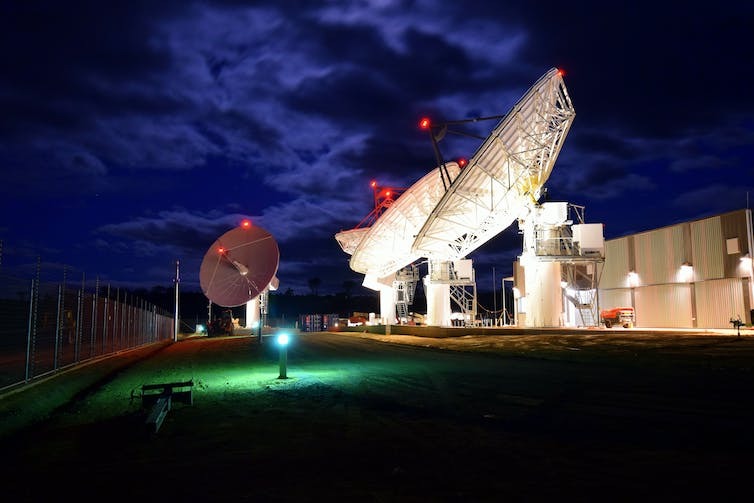 Unlike the case with its Skymuster I launch, NBN has not yet provided time lines on SkyMuster II in terms of its testing phase or when it will be ready to offer services. Given its successful launch in October 2016, one would expect it should be offering services by now. The Skymuster II satellite was launched in October 2016. If there is sufficient demand for in-flight broadband services, it might make it more attractive for the NBN to launch a third satellite to meet the growing demand. In addition, NBN could look at expanding the roll-out of fixed wireless services. This would migrate some customers out of satellite, and relieve the satellite bandwidth for in-flight and other applications. ViaSat is also building its own satellite constellation to offer high speed inflight internet across major international flight routes. The company seeks to cover 90% of the routes. Qantas hopes to complete onboard Wi-Fi infrastructure installation across its fleet of around 80 aircraft (737s and A330s) by 2018. It is not clear how the fleet would be split across domestic and international routes.